This tutorial is about solution for problem of Windows SBS C drive getting full. SBS 2003 users can increase the size of C drive with third-party partition software. Download IM-Magic Partition Resizer Server to get C drive extended when it gets full and shows low disk space warning on SBS 2003. It might be impossible to keep C drive from overflowing in SBS 2003 because Windows updates data, system files, Log files, some temporary files, etc are saved to this drive. If C drive gets full on Windows SBS 2003, you can take easy measure to get C drive extended. IM-Magic Partition Resizer Server is a partition software to help with disk partition resizing on Windows Server OS, so you can use this partition software to extend C drive on SBS 2003 when the drive is full and has low disk space warning. Download, install and launch IM-Magic Partition Resizer Server. Right click a partition that has large free disk space and select "Resize/Move" option. 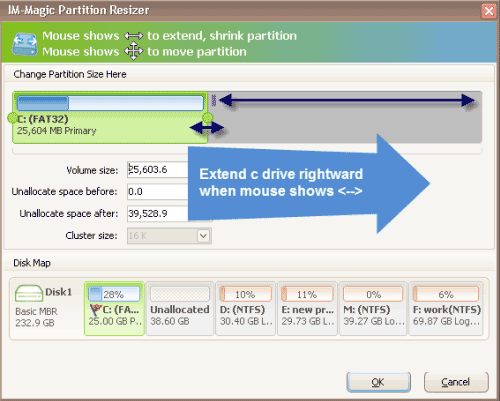 Shrink the selected partition when mouse shows double arrows to squeeze some free space. The free space will be shown as unallocated volume. Move the unallocated volume close to C drive. Right click C drive and select "Resize/Move" option. Move the arrow when mouse shows double arrows to extend C drive and then click "Apply" button. The problem of SBS 2003 C drive getting full keeps troubling and upsetting a lot of Windows SBS 2003 Server users because SBS 2003 is most widely used by small business and enterprise. If SBS 2003 has any problem due to C drive full issue, it will affect more than one computer. For some home computer users, they also like to install SBS 2003 operating system due to its good performance and benefits. However, C drive full problem always cause a terrible headache to them. Therefore, it is extremely urgent for both home PC users and business users to resolve the issue about C drive getting full. When C drive is nearly full on SBS 2003, you may find that your computer is running slower and slower. Sometimes, it may take a long time to open a file or a program. Then, Windows may pop up low disk space warning on C drive and ask you to delete some unnecessary or old files to free space. Finally, you may run into a series of problem with drastic consequences like blue screen, black screen and system crash. C drive full is not the only cause for those problems, but you can extend C drive when it is running on low disk space to avoid suffering such kind of disaster. If you have ever received low disk space warning on C drive in SBS 2003, you might know that Windows system often ask you to delete some old or unnecessary files to free space on the drive. Although it might be the easiest way to solve C drive low disk space problem, it is not the best solution. IM-Magic Partition Resizer Server provides an easy and good solution to extend C drive when it runs on low disk on SBS 2003. Since you can increase the size of C drive, you don’t need to move or delete any data. As long as there is free space on the same hard drive, you are able to extend C drive on SBS 2003 as you wish. You can run your Windows SBS 2003 in a virtual environment by using virtual machine software. IM-Magic Partition Resizer Server is able to work in VMware to get C drive extended when it has low disk space. You can extend c drive or merge free space to c drive in server 2003. This partition software doesn’t affect the system or data in VMware, so you can rely on this software. IM-Magic Partition Resizer Server enables you to resize disk partition on SBS 2003 VMware efficiently in a quite short time. 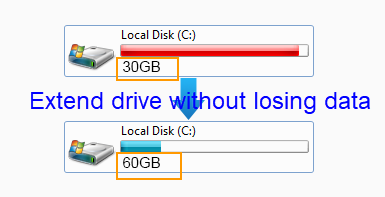 In addition to deleting files, some users like to repartition the hard disk to reallocate more space on C drive. However, repartitioning hard disk will erase all files on the disk. With IM-Magic Partition Resizer Server, you don’t need to repartition hard disk or move data, you just need to drag the mouse to shrink a partition that has large free disk space to squeeze some unallocated space. Then you can easily move the unallocated space to C drive to get it extended.